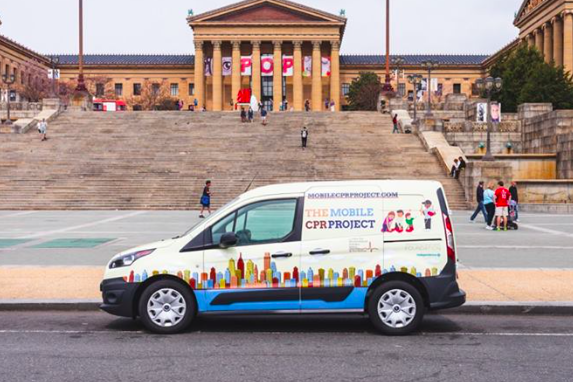 Mobile CPR Project van parked outside the Philadelphia Museum of Art. Every year, cardiac arrest kills more than 1,000 Philadelphia-area residents — and in many of those emergencies, it was a race against time. CPR training might have saved a life. Radnor Township Police Officer Anthony Radico came face-to-face with this harrowing situation in 2013. At the age of 46, Radico had just completed a workout at the gym when he went into cardiac arrest. His sister ran for help and found Amanda Beal, an occupational therapy student who underwent cardiopulmonary resuscitation (CPR) training about a year prior to the incident. She'd never before tried to administer it in real life, but there she was. She began with chest compressions and continued with CPR until paramedics arrived at the scene to resuscitate Radico with an automated external defibrillator (AFD). Radico was out cold for nearly eight minutes, a period that would have killed him had Beal not been there to help. The father of three is now back to work as a police officer. Earlier this week, experts from Penn Medicine's Center for Resuscitation Science and the department of Emergency Medicine were on hand at the WHYY Studio to help the City of Philadelphia launch its own branch of the Mobile CPR Project. First piloted in Hartford, Connecticut, the Mobile CPR Project was created to increase survival rates from sudden cardiac arrest by offering training sessions for citizens in groups of 10 or more. "Our number one goal is to train you how to recognize a cardiac arrest and to learn CPR," the group says at their newly launched Philadelphia site. "Learning CPR can keep you and your family safe. Most of the time when someone experiences a cardiac arrest, it is in their home. If your family member experiences a cardiac arrest the best thing you can do is perform CPR, it can save their life!" The project, funded by Independence Blue Cross, will host training sessions at community centers, shelters, schools, religious organizations, and community health fairs. Individual training sessions with certified health care providers can also be scheduled as long as at least 10 people will participate. The Mobile CPR van will drive out to scheduled locations, provide complete training and distribute CPR Anytime Kits to encourage practice at home. The entire initiative is part of the Philadelphia Regional CPR Awareness Coalition’s CPR Ready campaign, which aims to increase the regional base of trained individuals who are qualified and willing to perform bystander Hands-Only CPR and use an AED. More information on the Mobile CPR Project can be found here. To schedule a training session, you can call 215-746-4631, email themobilecprproject@uphs.upenn.edu or fill out an online scheduling form.